If you don’t have winter tyres this winter you may be wondering what all the fuss is about, and hopefully when you open the curtains in the morning to find a few inches of snow you will very sensibly leave the car at home. Ordinary tyres are a mixture of many different substances including rubber, carbon black, silicon, sulphur and the steel or kevlar reinforcing wire. The best tyres may actually have over a hundred different substances in, and the exact blend and cooking method can produce a range of tyres with very different abilities. 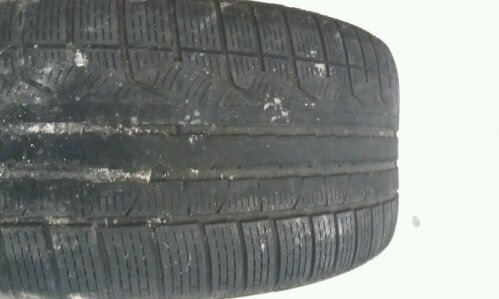 This summer tyre has wide tread blocks that don't move much. Ordinary tyres, sometimes referred to as summer tyres, are engineered to work well when hot, to last a long time and provide good dry grip. 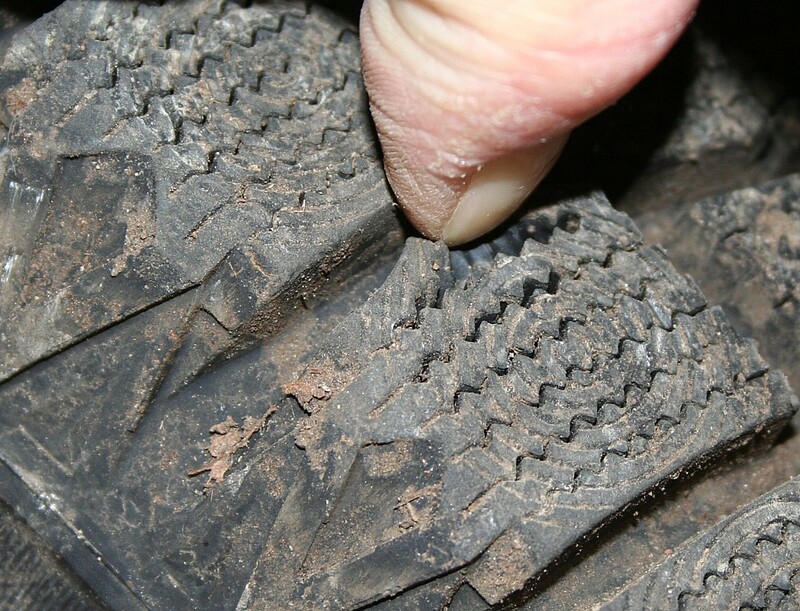 The rubber based tread compound in summer tyres is relatively hard and the tread blocks are relatively shallow and broad so they remain stable when pushed hard round corners etc. By comparison a winter tyres is made of a much softer compound which grips the road even when cold. If you run your hand over the tread of a tyre on a cold day a winter tyre will still feel rubbery but a summer tyre will feel harder, more like wood. But also the tread pattern is very different, the winter tyre will have deeper and narrower tread block, each with a multitude of deep cuts moulded in. This allows the tread to move about very easily and mould itself to the irregularities of the road, allowing it to grip even on ice. The winter tyre has very flexable tread. But there is more to tread wobbliness than that, rubber tread grips my moulding itself in to the road surface at a microscopic level, almost flowing over the tiny irregularities of the road surface and grabbing hold of them. But it takes time for the rubber to move into position, only a tiny fraction of a second, but whilst it is taking hold it needs to be almost stationary. Any slipping will prevent it taking hold properly and you get drastically reduced grip, that’s why wheel spin needs to be avoided. The tread allows this to happen by moving very slightly with respect to the tyre body (carcass), allowing the rubber in contact with the road to remain stationary as the wheel moves above it. In fact if you look at a graph of wheel slip against the amount of drive force actually being transmitted to the road you see a peak at about 3% on a summer tyre as the force makes the wheel turn slightly faster than the road beneath it whilst the tread is constantly moving back and forth as it passes through the contact patch. But as more throttle is applied and the slip increases it suddenly gets to a point where the tread movement can’t keep up, it starts sliding across the road and never has time to flow into the road surface, and then grip drops rapidly. There’s a lot going on in that tyre of yours. So the softer tread compound coupled with the wobblier tread block pattern gives a winter tyre much more time to get a really good grip of the road. Of course there is a down side to this, the wobblier tread means the car can drift more when pushed hard as the tread blocks almost ‘walk’ across the road surface, you’re not actually skidding but you’re not going exactly where the steering is pointing either. This also means that a winter tyre used in the summer will give worse stopping distances too, in fact a winter tyre starts to let the side down when temperatures go above 10°C and stopping distances can increase by 5%. The other thing is that the softer rubber would wear down faster in the summer, although modern winter tyres are a lot better than designs from a few years ago. But interestingly at temperatures below the critical 7°C a winter tyre will actually wear down less than a summer tyre because the tread slips less. In fact 7°C is a very important temperature, it is where a traditional summer compound undergoes a structural change at the microscopic level, the long rubber molecule chains start to lock together, hence it feeling more like wood at low temperatures. This means the tread surface can’t move and doesn’t have time to flow into the road surface as the tyre scrubs across the road when cornering, accelerating or braking. So below this critical temperatures the grip from a summer tyre starts to drop rapidly, as the rubber hardens it needs longer to grip but the hardening tread blocs actually reduce the time available in the contact patch. Everything starts to conspire against it. At extremely low temperatures the tyre can become brittle, I have seen customers enjoying luxury cars in northern Russia reporting tyres shattering below -40°C as they pull away. By comparison winter tyres still work acceptably well at -40°C, which is the standard low temperature the whole car industry tests their cars at. But even winter tyres will eventually become hard as the temperature drops even further. My Bargain Banger not getting stuck, very pleasing. So on a day where the temperature is struggling to get above freezing a winter tyre will out perform a summer tyre by quite a large margin, but even at 5°C there is a noticeable difference, Continental Tyres claim a 7% improvement on a wet road. But when there is snow and ice on the road the winter tyre design works well and the summer tyre looses most of its grip completely, making pulling away on gentle slopes almost impossible and generating entertaining video clips for the news channels. On the continent it is common to have two sets of wheels for your every day car, new car dealers will store your other set for a nominal fee, usually about 50 Euros so you don’t need to find the storage space at home. This is something we are starting to see in the UK now too. Many people run smaller wheels with higher profile winter tyres to allow even greater flexibility and resilience to pot holes and uneven chunks of ice. This also means your nice shiny summer wheels don’t get covered in road salt and chipped by grit. When buying a second hand car it is easy to pick up a spare set of wheels for your winter tyres to go on, often the smallest wheels offered for your type of car are sold on cheaply as owners upgrade to bigger wheels. When storing winter tyres over the summer it is important to keep them out of sunlight which hardens the rubber and prematurely ages them. Some people may be tempted to just by two winter tyres, particularly for front wheel drive cars. In the snow and ice having a set of winters on the front of a front wheel drive saloon will make the world of difference, both for pulling away and for stopping. As more of the weight is over the front, which drives and steers the car, the vast majority of the traction is needed right there. At low speeds in such conditions some might argue that the back just needs to follow the front to some extent and so winter tyres are less critical, however nothings ever quite that simple. When you get to clear stretches of road, having substantially lower grip at the back could get you into trouble, most notably if you have to slow or stop suddenly on any sort of band where the back could drift out. On older cars it would be worse as the rears could lock up and, worst case scenario, send the car into a spin, but as yours has ABS it wont actually let the rears lock up but could still run wide. Obviously this all depends on exactly how ropey your old tyres are, low tread depth and aged hard rubber make things much worse. For this reason the only ‘safe’ way is to do all four, although having two winter tyres is better than none. 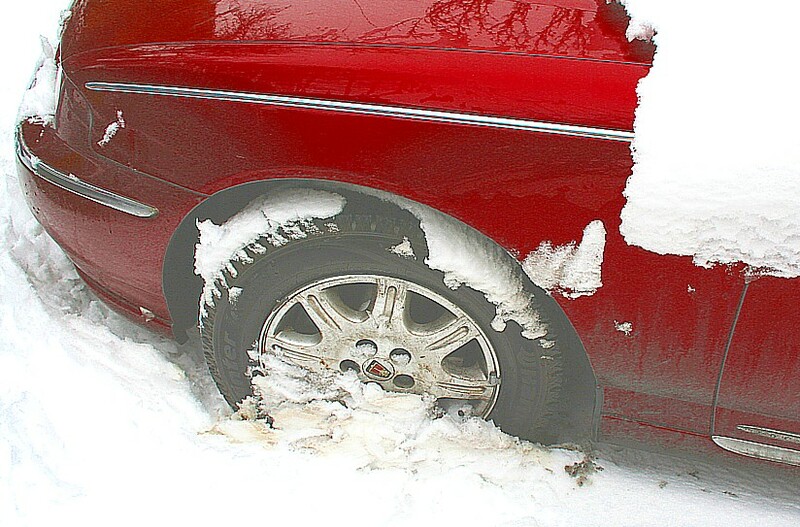 Putting two winter tyres on the back of a rear wheel drive car is much more dangerous, it would then have the ability to pull away on very slippery surfaces but have very poor steering and braking ability due to the summer tyres on the front. It could pull away, accelerate, get to a corner and plough straight on into a ditch. Even on rear wheel drive cars front wheel traction is vital. But what about four wheel drive cars, do they need winter tyres too? If we assume the 4WD car is on new full tread summer tyres and the other car is FWD with equally new winters on, then the winner when pulling away depends hugely on conditions. On a typical compacted snow/ice British winter road the summer tyres will have very little traction and the 4WD may struggle, but these are precisely the conditions that the winter tyres were designed for and the FWD car will probably get away quicker. But if we throw in some fairly thick slush with tarmac or gravel underneath then the fact that both axles on the 4WD are digging through it may tip the advantage it’s way, the FWD having the extra burden of dragging its back axle through the wedge of clag. In this case a RWD car on winters would suffer even more as the front axle has to be pushed through a bigger wedge than the rear. But driving is so much more than just the ability to pull away, and once on the move the advantage tips decidedly towards the 2 wheel drive car on winters, every other aspect of traction relies on all four wheels and when cornering or braking the car wearing winters will have a clear advantage. The example I frequently quote is a Quatro I saw pulling out of an icy T junction last year, four wheel spin and a bit of snaking and it got up to speed, tried to turn right and fell straight in a ditch. Of course the Quatro on winter tyres would be quite a different storey. Well that’s enough theory, I tried a set of modestly priced winter tyres from Goodgrip, a Scandinavian company that has just set up in the UK and is used to dealing with tyres for extreme conditions. The Hankook ‘Winter i*cept’ tyres are at the lower end of the price spectrum so I can’t be accused of cheating by buying an exotic tyre. These went on to my trusty Bargain Banger Rover 75, so again no cheating by using advanced stability control etc. After fitting them we proceeded to experience one of the warmest Christmases on record, but this was in itself a good test and at temperatures a shade above 10°C the winter tyres clearly drifted in corners more than summer tyres, but nothing alarming. It should be born in mind that I was testing the tyres, deliberately pushing them hard and putting them in the most demanding circumstances and I feel that someone driving ‘normally’ wouldn’t even notice this extra drift tendency. Unless of course they had to do an emergency stop, that 5% increase in slip means at motorway speeds the stopping distance increases by approximately one car length, from 20 to 21. So although it’s worse it is by no means catastrophic, even so I would rather use summer tyres in the summer. More recently we have enjoyed snow, ice and temperatures below -6°C, including a few days where the snow partially melted, froze overnight into sheet ice and had fresh snow over it in the morning. Traction on icy roads is very impressive. The winter tyres worked very well, pulling away easily up hill with four inches of snow on top of ice. In fact the snow seemed to help with grip on the ice, bare sheet ice has a smoother surface and presented more of a challenge, but even here the winter tyres were very good. Of course applying too much power or going to fast round a corner will still result in a skid, but as the limit of traction is encountered the winter tyres started to break away more gradually and maintained at least some control of the vehicle. Their ability was highlighted to me by a colleague who commented that a particular corner we had both driven was very slippery and he nearly lost control, where as I had driven round it as normal with absolutely no problems. So clearly for every day driving in low temperatures the winter tyre is definitely safer and well worth the expense. There are some other things worth mentioning too, firstly the softer compound gives a quieter and slightly softer ride. Secondly I got very slightly better fuel consumption. At low temperatures the car will use more fuel anyway for a multitude of reasons, but as a direct comparison on the same route driven in the same conditions (between -2°C and +5°C) the winter tyres on my car averaged about 3% better economy, probably because at these temperatures the summer tyres slip more. I do a high mileage so this saves me about £2 a week and may save £30 over the winter which offsets the cost of the tyres slightly, a full set for my car was just over £200. So in summery for an investment of effectively £170 I have a car that is still usable in the winter, much safer to drive, slightly more relaxing and removes that anxiety drivers feel when watching the weather forecast. I think that is a small price to pay. As an experiment, and to answer many of your questions, last year I ran a set of winter tyres all year. I do a fairly high mileage, usually about 700 miles a week, and usually I drive reasonably hard, so it was going to be a good test. The first thing to note is the grip on a warm dry day is very modest, they don’t so much slip as glide when driven hard, drifting deeper in corners. It’s all very progressive an easy to control, and of course if you drive a bit slower you may never notice this trait. But of course emergency manoeuvring and emergency stops will also be less sharp. By comparison, when I bought the car originally it had some nasty budget summer tyres on, fairly new, but the Hancook iCept winter tyres were better than the budget summer tyres even in the dry. Budget tyres are usually worse at pretty much everything. So basically the winter tyre was perfectly usable in the summer, not as good as a summer tyre but not as bad as the cheapest budget tyre. However, the soft compound did wear at a noticeably higher rate. Interestingly the tyre tread area became concave, the centre wearing twice as fast as the edges. This is because the softer compound allows the centre of the tyre to centrifuge out at high speeds, and as I do a lot of motorway mileage it basically took the middle out fairly rapidly. 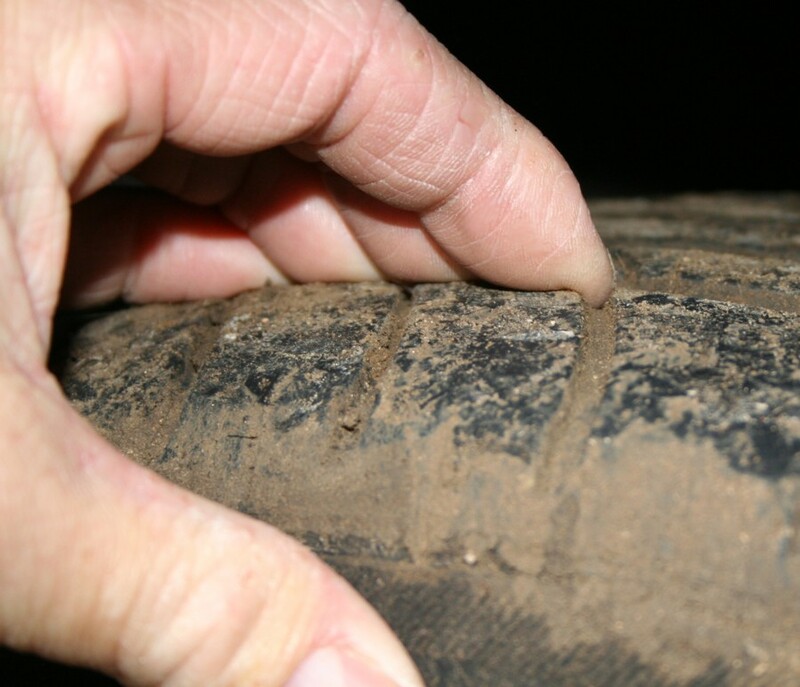 The tyre started with about 10mm tread depth all over, after just over 20 thousand miles and eight months the edges were down to about 4mm and the centre was about 2mm. 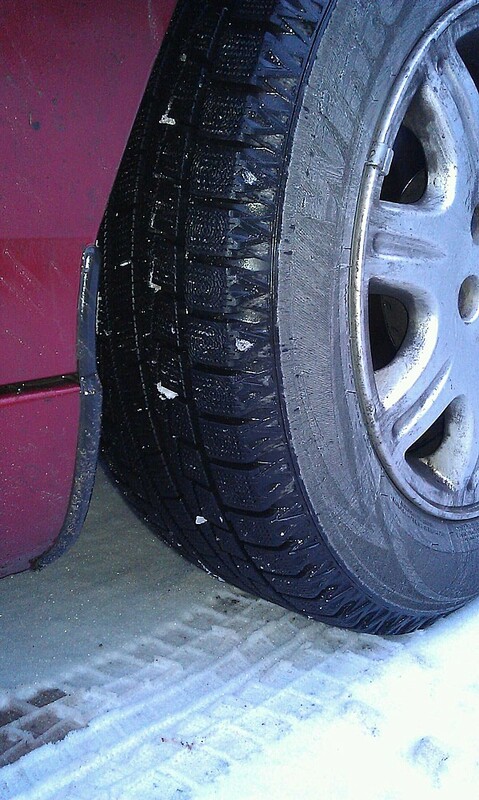 See how the tread is now concave, even thought this high mileage winter ran at the correct pressure. So, in conclusion, if you do less than 10 thousand miles a year and don’t drive like a man possessed then a good quality winter tyre could last a couple of years. For everyone else it is better to store the winters in the garage during the summer. Or alternatively use good all season tyres (an experiment I have just started with Goodyear 4 Seasons from Goodgrip), or indeed stay at home for the few days a year when the roads are covered in ice. I also did some experiments fitting winter tyres to the front and leaving summer tyres on the back, a lot of people asked me about this sort of set up so I thought I better try it for myself. I tried braking mid corner in the worst winter conditions which should be the worst case scenario for this set up, and although the back did drift slightly further out than normal it was nothing dramatic. This was on a Rover 75 which is longer with a lower relative centre of gravity than some of the cars that are sighted as having problems, such as a Fiat Panda, with just two winters on. I think that this may be because the relative lack of rear grip on ice affects the shorter and taller cars more. So although on my test car it worked fine, it does seem to depend on what sort of car is used, it will also depend on the design of the non-winter tyres fitted on the back, mine had good tread depth and large radial grooves which may have helped. So I cannot recommend this format universally, and considering a good winter tyre for an average family car costs less than a full tank of fuel I think it is false economy to only kit out one axle with winter tyres. In summary, winter tyres – still love ’em.